(+ / -) "Sit" for 30 minutes every day to write. — I ended up giving myself the first weekend off and did so again on the second weekend, but still go back into it each time Monday rolled around. 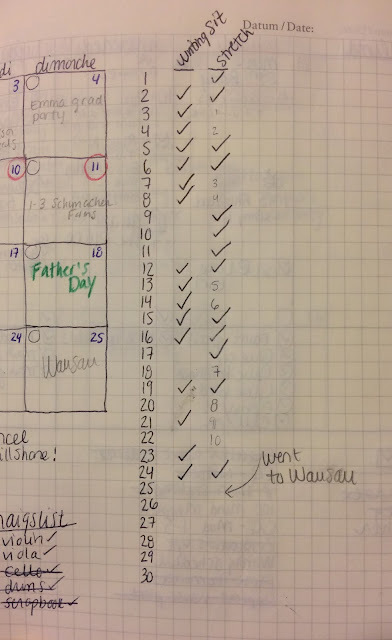 I got completely off schedule the final week, though, when I was up in Wausau visiting family sans notebook. I wrote more than I would have otherwise, liked the rules/ritual of the "sit," and finished two longer reflections I'd been meaning to start—so that feels good! ( - ) Apply for VIPKID. — I didn't apply for this job; my heart's just not in it. However, I applied for a different job this past Sunday—a seasonal gig this fall—and I might have updates soon. (-) Stretch or pilates 20 of the 30 days this month. 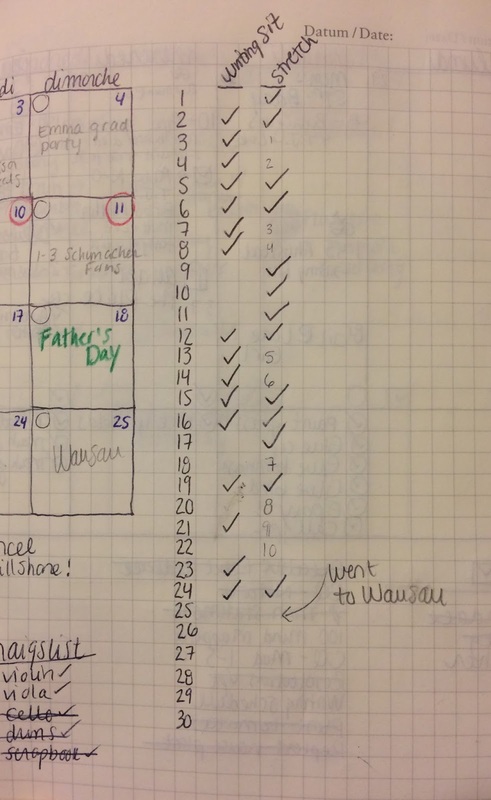 - As you can see on the above chart, I had a check for 13 days before I stopped doing/recording on the 25th. So, didn't make it to my goal of 20, but that's still 13 days of stretching I wouldn't have done otherwise. Progress! (+) Track in bullet journal. — I tracked it through the 25th. (+) Schedule PT appointment — Taking advantage of my state health insurance while I'm unemployed, I made an appointment to see a PT next Monday. I'm hoping to get specific exercises to help me improve hamstring flexibility and core/back muscle strength, taking my spinal fusion into account. (+) Read at least 10 more books. — I finished nine and am in the middle of two others. A few days ago I already hit my 2017 goal of 42 books! In June, just halfway through the year! Sketchnote Saturdays. — I didn't do any sketchnotes this month... whoops. I didn't get this one onto my weekly layouts in my bullet journal—the first step for me to do something. While in Wauasu for three days at the end of the month, I went to two different parks (thanks to my sister's summer project of learning to identify trees and birds). I went to three of the four "Tunes on Tuesdays" at a neighboring park, walking the paths two weeks with a friend and one week with my sister. I've continued to bike and walk around wherever I need to go in town. I spent three of the four Saturdays out at my grandma's—either decluttering inside or chopping down trees or weeding out in the prairie. I'm going to be out of town for the last two weeks of the month, and we're almost already a week in. Which means I have just about a week remaining at home this month (!! ), so the action items below will feel light. Give talk at public library — This is scheduled for next Tuesday, so it's for sure happening. I have to prepare/create the presentation yet, then show up and share my experiences and truths. Advocate for myself at PT appointment — The appointment is scheduled and happening, but I'll need to clearly communicate what I'm hoping to learn/gain. I had an appointment with a PT in 2015 before I left for France and did not get what I was looking for. It's taken two years for me to try again, so I have to be tough and advocate for myself. Bonus points for stretching while away from home — I'll be a volunteer counselor at a camp for a week in Minnesota, then spending a weekend with my aunt and uncle, followed by a week at my brother's in La Crosse. The short 3-day trip to Wausau last month reminded me how easy it is to stop routines when I'm on the road. So I'll try to find a method/way to keep stretching at the forefront even while my daily routine gets thrown up in the air. Don't take computer along for 2-weeks in MN/LaX — I'll leave my computer at home for my travels up north, how's that for unplugging? How was your June? Have you ever done a mid-year reflection? What are you looking forward to in July? I'll stretch/do outdoor things with you. It's easy to be outside in Lax!